CALL US NOW IF YOU ARE HAVING ISSUES WITH YOUR GE REFRIGERATOR! We are open 24/7. If you’ve grown tired of your refrigerator making funny noises, freezing your vegetables or failing to keep things quite cool enough, it’s time to call for repairs. A GE refrigerator is a fantastic appliance, but even with gentle treatment, it can eventually break. The sooner you act, the better it will run after repairs. No matter what problems you feel may be present in your GE refrigerator, call All Time Services today. 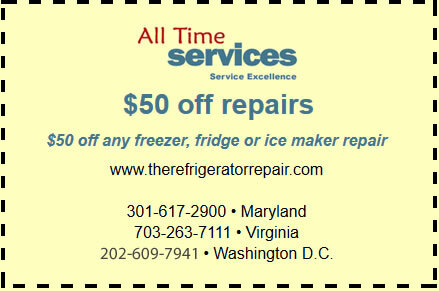 We offer a full range of GE refrigerator repair services Virginia, Arlington and fridge repair services in the greater Washington D.C. area and we can get your fridge back on track fast. Thermostat Issues – If the thermostat isn’t working properly, you’ll notice a few things. Most commonly, the compressor will fail to turn off and the food in your GE refrigerator will freeze. In some cases, a thermostat issue can cause problems with your defrost timers, resulting in excess buildup or even leaks in your freezer unit and fridge. Door Issues – If the spacers or gaskets on your door are broken or missing, it may result in your compressor being forced to work much harder than it would normally. Additionally, you may notice condensation on the fridge. Compressor Issues – A compressor problem can manifest in a number of ways, from a lack of cooling to excess noise or constant running. If you notice any of the problems listed above, call us to inspect and repair your fridge right away. Don’t ever attempt to repair you refrigerator yourself because these are complex appliances with multiple electrical components and a compressor assembly. Those not trained to work on GE refrigerators, may put themselves and their refrigerator at risk. For quick and professional repair services, you need to call All Time Services today. 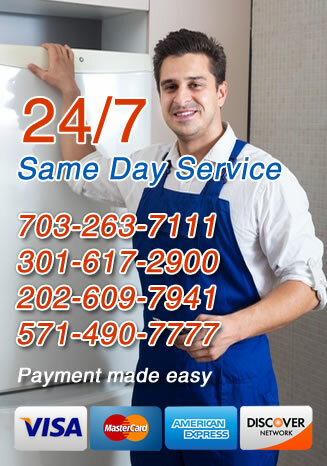 With years of experience repairing GE refrigerator repair services in Virginia, Arlington, Gaithersburg, MD and the Washington DC surrounding areas, we have everything needed to fix your fridge fast.